The legion of riders, staff and volunteers enjoyed autumn-like weather as they checked in and prepared for a seven-day bike ride from Presque Isle to the St. John Valley and back. 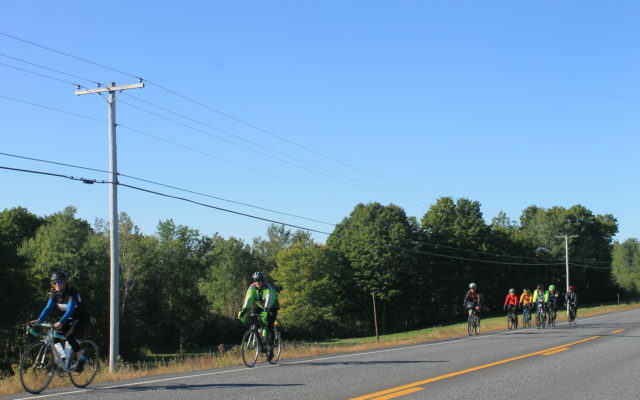 PRESQUE ISLE, Maine — The 450 bicyclists participating in BikeMaine’s 325-mile ride through Aroostook County started their trek in cool, sunny weather Sunday morning. With temperatures topping off around 60 degrees Saturday, the legion of riders, staff and volunteers enjoyed autumn-like weather as they checked in and prepared for a seven-day bike ride from Presque Isle to the St. John Valley and back. After an early breakfast Sunday, riders started their 51.8 mile ride to Caribou by way of Fort Fairfield and Limestone, with the ride taking them through the heart of central Arootook’s farm country and the former Loring Air Force Base. 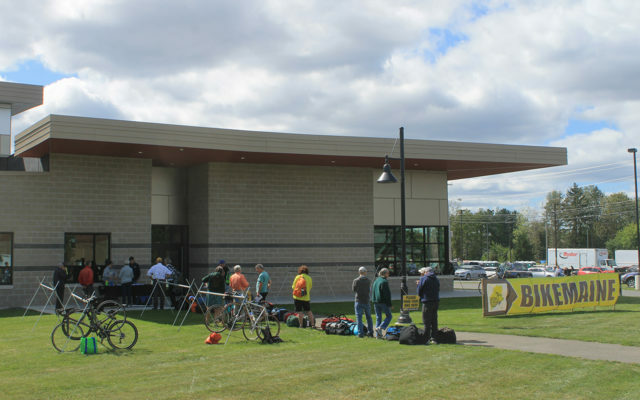 “We’re really excited to be in Aroostook County,” said Will Elting, the BikeMaine event coordinator with the Bicycle Coalition of Maine who’s overseeing logistics for the event. Overnight lows were expected to dip into the 30s Sunday and Monday nights, while warmer than average temperatures are likely through the rest of the week, with a chance of showers Monday night and Tuesday, according to the National Weather Service. Riders with BikeMaine ascend Fort Fairfield Road in Presque Isle on the first leg of their seven day, 325-mile trek through Aroostook County. This year is the sixth annual BikeMaine tour and the first time the event has ventured north of Bangor. The seven-day, 325 mile ride runs Sept. 8-15, and includes overnight stays in Presque Isle, Caribou, Madawaska, Fort Kent and St. Agatha. 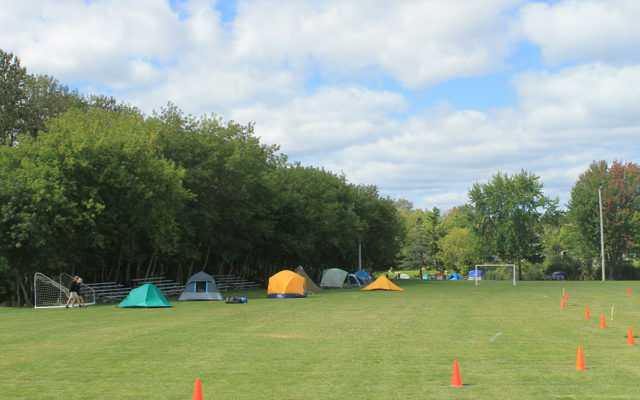 Bikers arrived Saturday to camp on the athletic fields across from Presque Isle’s Sargent Family Community Center. A variety of activities scheduled for the day included trips aboard the Presque Isle Historical Society’s trolly bus to local historical sites and parks. Saturday night’s schedule included a welcome party and concert featuring the Star City Syndicate. Volunteers include service groups from the different host communities and students from the Katahdin Learning Project at Katahdin Middle/High School in Stacyville who are serving as the tent and porter crew. Steve Inkellis of Harpswell, a first time BikeMaine participant, was among the riders arriving early in the afternoon to set up a tent along the Presque Isle Stream. Inkellis is riding with his friend Bill Muldoon, secretary of the Bicycle Coalition of Maine board of directors, and like many is a first time rider in these parts of northern Maine.